Is a Progressive -Libertarian Movement Possible in the USA? When was the last time a politician came across like the lone voice of principle railing against the dangers of an imperial presidency? That’s what it looked in Spring 2011 when Ron Paul, the Texas libertarian running for the Republican presidential nomination, wrote candidly about the War Powers Resolution, the Patriot Act and mission creep after 9/11. The column was called “Enabling a Future American Dictator.” At times he sounded a lot like Bernie Sanders. In the column Paul noted that the 60-day deadline for getting congressional approval of the current military action in Libya under the 1973 War Powers Resolution had passed without notice. Predictably, he chided President Obama for not seeking a congressional OK and wondered whether he ever would. Forget Paul’s party for a moment. Wasn’t he on to something? The Constitution, specifically Article 1 Section 8, clearly states that the power to declare war rests with the legislative branch. The original idea was to prevent the president from exerting the powers of a king. But presidents have been manipulating and ignoring such constitutional limitations for more than a century. Given the expansive nature of the federal government, Paul warned that “it would be incredibly naïve to think a dictator could not or would not wrest power in this country” at some point in the future. A bit of negative extrapolation there, but still, many people across the political spectrum do worry that it could indeed happen here. It’s the kind of argument you expect to hear from Sanders. Actually, the two lawmakers did sometimes join forces when Bernie was a Congressman. Later, the godfather of the Tea Party movement and the junior Senator from the People’s Republic of Vermont teamed up to propose military budget cuts and push for a more thorough audit of the Federal Reserve. Were these just isolated moments of Left and Right collaboration? Or could a movement that attracts both progressives and libertarians actually develop? Paul also pointed to the Defense Authorization bill. It “explicitly extends the president’s war powers to just about anybody,” he claimed. The problem — Section 1034, which asserted that the US is at war with the “associated forces” of al Qaeda and the Taliban. Bringing in civil liberties, Paul asked how hard it would be “for someone in the government to target a political enemy and connect them to al Qaeda, however tenuously, and have them declared an associated force?” It’s an argument that Left-leaning activists should find relevant. His forecast was that even if we assume the people in charge at the moment are completely trustworthy – a major assumption – the future is far from certain. “Today’s best intentions create loopholes and opportunities for tomorrow’s tyrants,” Paul warned. Given the current crop of potential national leaders, it’s hard to disagree. While a Texas Republican may not be the best messenger for a new alliance, Paul did have a following, based largely on his strict libertarianism and 2008 presidential run. Then the financial crisis seemed to spark something new: the potential for a convergence between progressives, liberals and traditional libertarians. In January 2011 Ralph Nader called the prospect of such an alliance the nation’s “most exciting new political dynamic.” Another element was generational change. Sparked by the excesses of elites and the wealthy few, a resistance movement fueled by youthful energy – an American Spring? – began to show the potential to catch fire and break down political boundaries. Among the issues that framed its agenda were intervention and military spending, individual freedom, and financial reform. One of the unifying themes is the desire to limit, and whenever possible reverse the influence of centralized wealth and power. Sanders, who describes himself as a democratic socialist, has frequently expressed this perspective, forging alliances that cross party lines to challenge corporate secrecy and the powers of international financial institutions. Much of Sanders’ early legislative success came through forging deals with ideological opposites. An amendment to bar spending in support of defense contractor mergers, for example, was pushed through with the aid of Chris Smith, a prominent opponent of abortion. John Kasich (now Ohio governor and GOP candidate), whose views on welfare, the minimum wage and foreign policy as a congressman could hardly be more divergent from Sanders’, helped him phase out risk insurance for foreign investments. And a “left-right coalition” he helped to create derailed the “fast track” legislation on international agreements pushed by Bill Clinton. 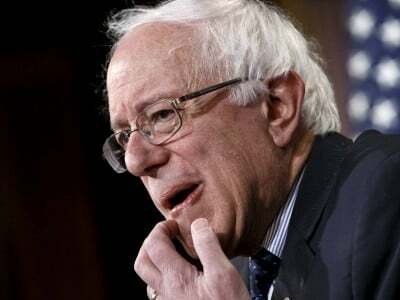 The impact of the strategy was clearly felt in May 2010 when Sanders’ campaign to bring transparency to the Federal Reserve resulted in a 96-0 Senate vote on his amendment to audit the Fed and conduct a General Accounting Office audit of possible conflicts of interest in loans to unknown banks. Here is Sanders’ overall view in a nutshell: International financial groups protect the interests of speculators and banks at the expense of the poor and working people – not to mention the environment – behind a veil of secrecy. Meanwhile, governments have been reduced to the status of figureheads under international management, both major political parties kowtow to big money flaks, and media myopia fuels public ignorance. Many libertarians, even a good number of Tea Party people, agree. But how do you mobilize and unite people across traditional cultural and political lines? A key may be found in sovereignty and nullification campaigns. Diverse as these efforts are, most rest on the proposition that the states and sovereign individuals created the national government. Therefore, they have the right to at least challenge the constitutionality of federal laws, and potentially even decline to enforce them. Though this may sound more conservative than not, liberals and leftists do also adopt such a stance at times. Resolved, that the several States composing the United States of America, are not united on the principles of unlimited submission to their General Government; but that by compact under the style and title of a Constitution for the United States and of amendments thereto, they constituted a General Government for special purposes, delegated to that Government certain definite powers, reserving each State to itself, the residuary mass of right to their own self Government; and that whensoever the General Government assumes undelegated powers, its acts are unauthoritative, void, and of no force . . . .
That the Government created by this compact was not made the exclusive or final judge of the extent of the powers delegated to itself; since that would have made its discretion, and not the Constitution, the measure of its powers; but that as in all other cases of compact among parties having no common Judge, each party has an equal right to judge for itself, as well as of infractions as of the mode and measure of redress. After Jefferson enacted a trade embargo as president in response to British maritime theft and the kidnapping of sailors, state legislatures nullified the law using his own words and arguments. On February 5, 1809, the Massachusetts legislature declared that the embargo was “not legally binding on the citizens of the state” and denounced it as “unjust, oppressive, and unconstitutional.” Eventually, every New England state, as well as Delaware, voted to nullify the embargo act. Moral for Jefferson: Be careful what you resolve. Two centuries later, in August 2010, the Missouri legislature used similar logic to reject the health care mandate in the Democrat’s health care reform, followed by a flood of legal challenges from state officials. In recent years, several states have also either passed or proposed legislation or constitutional amendments designed to nullify federal laws in the areas ranging from firearms to medical marijuana. The Tea Party movement, set in motion in 2009 by widespread disapproval of the federal government’s bailout of financial institutions, initially swelled into a tidal wave of anti-big-government sentiment that helped the Republican Party regain control of the US House in 2010. Supporters said the movement marked a return to core values. Critics called it reactionary and possibly racist. It is certainly funded in part by wealthy interests who see its angry members as tools to advance their own deregulation, limited government agenda. And yet, the Tea Party phenomenon is also a loose and relatively diverse association that includes fiscal conservatives, Christian fundamentalists, secular libertarians and more. A March 2010 poll estimated 37 percent support for its basic economic agenda, although that may have been its high water mark. The main take away is that it encompasses a variety of impulses, from orthodox libertarianism and neo-isolationism to populist anger directed at elites, deficit spending and perceived threats to US interests. Some have written off the recent anti-federal government rebellion as a Republican ploy. But there have certainly been Left-wing crusades against federal abuse of power in the past, and liberal nullification campaigns to decriminalize marijuana and bring National Guard units home from wars overseas. Will most Tea Party people join forces with progressives? Not likely. The main obstacle is several generations of cultural war, passionate and sometimes violent disagreement over racism, abortion, immigration, entitlements and climate change, among other things. In fact, progressives and Tea Party people can sometimes perceive different “realities.” Since 2008 many on one side have decided that Obama is a socialist, maybe even a Muslim Manchurian Candidate. On the other side, many say he is at best a sell out, and in some ways has doubled down on the mistakes and abuses of the previous administration. One group says climate change is a hoax or at least exaggerated, and the government should institute literacy tests for voting. The other sees ecological (or economic) catastrophe around the corner, thinks guns should be carefully controlled, and sometimes even argues that states ought to seize public resources as “trustees” of the commons. At the same time, however, there’s enough common ground to attract people from across the conventional divide. Don’t both libertarians and progressives believe that the size and reach of the US military should be limited? Don’t both think that civil liberties are being eroded by executive orders and legislative overreach? Beyond that, they also agree, perhaps more than either has yet acknowledged, about the greed and dysfunction of big institutions, and the need for more transparency and oversight. In this regard, Sanders has pointed the way. At times libertarian voices are even bolder than progressive counterparts, especially those who say that the War on Drugs should end and most if not all drugs should be legalized. But Sanders is gradually embracing this campaign. If that’s not convincing, ask yourself what could happen without some attempt to create a progressive-libertarian connection. Most libertarians, Tea Party members and others dissatisfied with the status quo will be actively wooed by conservative demagogues. Many will be sidetracked into grievance and resentment. Where else will they have to go? Still, it remains to be seen whether the issues on which there isn’t much common ground – and these should not be underestimated – will make it impossible to create or sustain some solidarity. On the other hand, if a multi-issue alliance could bring people together across the usual ideological barriers around galvanizing issues, how about these: end corporate welfare, bring the troops home, new economic priorities, roll back repressive legislation, and full financial transparency. Such a list is probably incomplete, and for some, may not go far enough. Fair enough. But it does potentially bridge some of the divisions that keep many people fighting among themselves while realigning conventional politics. In the long run, a Progressive-Libertarian movement probably wouldn’t last. But before it faded – if people overcame some traditional divisions, if the debate really changed and some new thinking took hold – wouldn’t the moment be exciting? Greg Guma is the author of The People’s Republic: Vermont and the Sanders Revolution. This is adapted from his original radio broadcast on The Howie Rose Show, Friday, June 3, 2011, on WOMM (105.9-FM/LP – The Radiator) in Burlington.